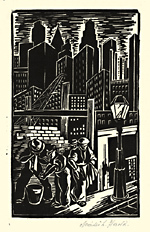 Untitled (Night Shift) - c.1930, Woodcut. Image size 7 1/8 x 4 3/8 inches (181 x 111 mm); sheet size 9 x 8 inches (229 x 203 mm). 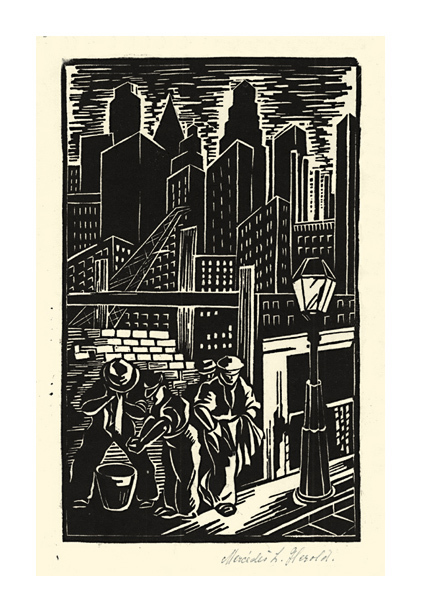 A fine, black impression, on cream wove Japan paper, with full margins (5/8 to 1 7/8 inches). Tape stains in the outer margins, otherwise in excellent condition.